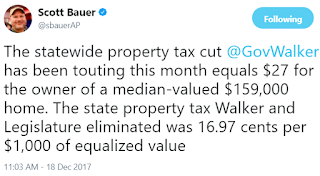 DemoCurmudgeon: Taxes Rise, despite Walker's 100% property tax cut! 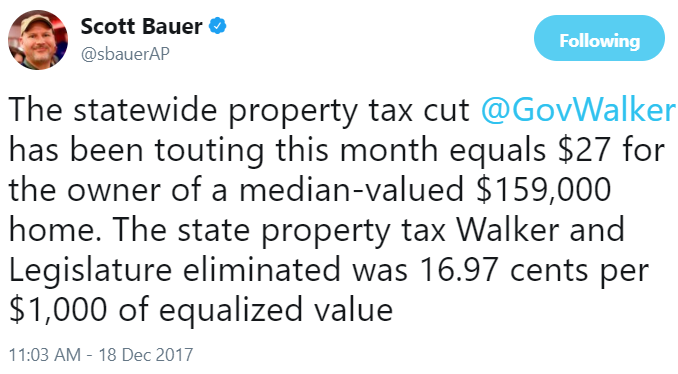 Taxes Rise, despite Walker's 100% property tax cut! My conservative, in-the-tank "Trumpian" friend in Milwaukee, isn't paying any attention to state politics. He's like many Wisconsin voters who have pretty much given up trying to understand what Republicans are doing based on the chaotic messaging put out by Scott Walker and Paul Ryan. It's a shell game pure and simple. There's no free lunch they say, but you'd never know that listening to Republican legislators and Scott Walker. It's just another attempt to try and sell that free lunch in a new and improved shining tax cut package. Walker is running again on failed supply side record, a campaign that fosters rural resentment, claiming the government is too big, which really means he's willing to squander a century's worth of public investments for a few dollars worth of tax cuts. In 2019, large corporations and other businesses in Wisconsin would receive 46 cents out of every dollar delivered into the state by the federal GOP tax cut bill, according to a new analysis. $2.5 billion in 2019, or a bit less than the $2.8 billion delivered to individuals and families in the state. But because the bill's tax cuts for individuals are set to expire in 2025, the tax cuts for corporations would easily outweigh them by 2027. In that year, individual taxpayers would pay $384 million more while large corporations in Wisconsin would still see a tax cut of just under $1 billion. Plus part of the lottery credit is a result of shifting GPR (that is, sales tax and other general purpose revenue) over to the Lottery to cover advertising expenses. By law, the lottery is supposed to be 100% self -sustaining. Money paid for lottery tickets is supposed to pay for everything. Walker slipped in this (possibly illegal) payment of GPR into the lottery budget to make the tax bills look better. Todd Berry of Wisconsin Taxpayer Alliance wrote about this, I think in Urban Milwaukee. One scam after another from Walker.